The weeks they come and the weeks they go. This one seems to have gone very quickly. Time always goes more quickly when you have lots to do. Not all of it is fun but much of it is fun and rewarding. It takes seven days to make a week. By my count, another week's gone by. It was a week in which I did my job and I believe I did it well. It's nice to know you've pulled your weight. It gives you a nice warm feeling of satisfaction. I've been working on an interesting problem and I figured something difficult out this week. I was enlightened by someone in the know. I'm glad the light bulbs got switched on. I finished and signed the painting I've been droning on about over the last several weeks. Now I have to figure out how to upload it to Etsy or eBay or some such platform. That will be an adventure - I've never sold anything on eBay or Etsy before. The journey of a thousand miles "begins with the first step". 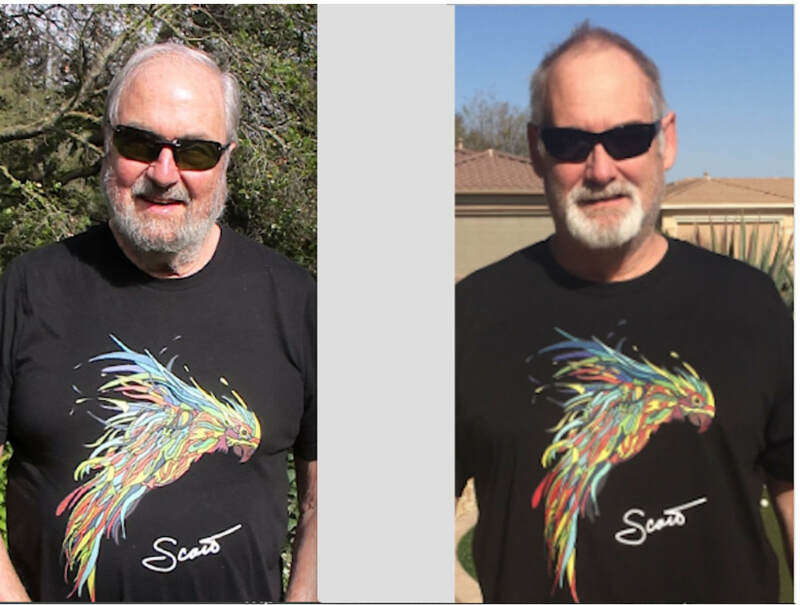 I did find out I have a fan in Montreal who bought one of my T-Shirts on Redbubble. I wish I knew who it was. Whoever it is, they left a very nice comment for me and for that I thank you very much. As I make my way through this life, I am glad to have you all along for the journey. I hope my weekly postings inspire you to pick up your pen or pencil or paintbrush or whatever medium you choose to use and make something beautiful. Give it a try. I'd love to see what you make. Send me a picture. Making things is so satisfying. The artist I'm bringing to you today won ArtPrize 2012. If you take a look at her work I'm sure you'll understand how that happened. The scale and creativity she puts into her work are inspiring. 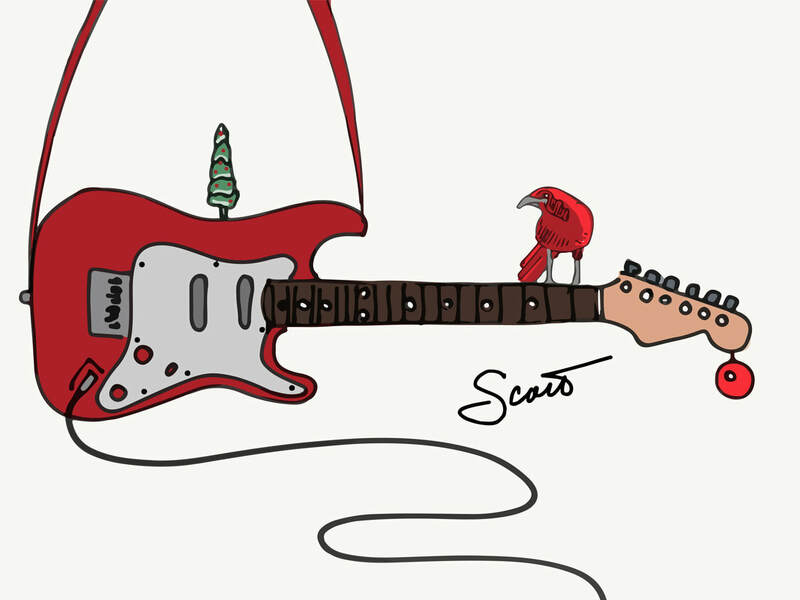 Every drawing has some twist you might not expect. Each one has a theme and tells a story. Her own story is also inspiring. After graduating from art school she was poised for a great career as an artist. She thought it was a practical step to stop pursuing her art when her daughter was born. Money needed to be coming in. Adonna took up a position teaching art in a primary school to have a consistent paycheck. Through the urging of a friend, she entered the ArtPrize competition in 2012. She put her head down and drew for weeks and came up with a massive charcoal pencil drawing that ended up winning her first prize. I think the prize was $200K. That's a bit of life-changing cash. It's kind of like a Cinderella story in real life except there wasn't a prince or a slipper or a pumpkin coach. She just worked hard, studied hard, and had the guts to give it a go. So I guess not much like Cinderella. The title of the piece is "Elephants"
Adonna continues to work in her studio in Southern California. She has such a great story. You need to hear it for yourself from here in this video. I'm sure you'll love her story. I take heart she was able to accomplish her dream. We should all encourage each other to follow our respective dreams. Be an encourager, not a discourager. Help people along their way and help keep them motivated. 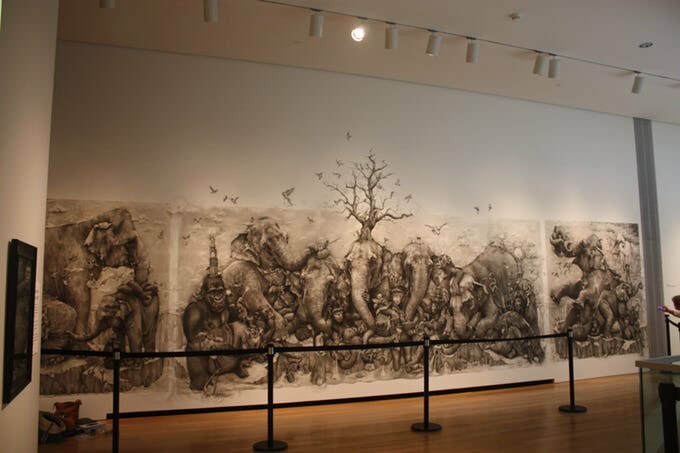 Adonna has multiple venues where you can see her artwork. Here are places on the internet where you can discover more about Adonna and her fabulous art career. "The early bird gets the worm" or at least that's what I've been told all my life but I think this morning was pushing things a bit. At 4 am in the morning on Tuesday I was doing what most peoples do. The insides of my eyelids were getting a thorough inspection. While I was enjoying my very own oneness with the universe, I heard a mind piercing chirp. It was either the loudest bird I've ever heard or it might have been the loudest, highest-pitched gunfire anywhere in the known universe. That little chirp at oh dark thirty had me perched upright in about 0.00001seconds flat. It turns out the battery in the fire alarm had just gone out of commission and the alarm was warning me that it might be time for a new one. Note to the manufacturer: Please use a nice soothing Siri or Alexa type voice or better yet HAL from 2001 A Space Odyssey. "Scott, your alarm needs a new battery." I can hear it now. As it happens that little helpful chirp had enough adrenaline pumping through my veins to lift a 2-ton truck off a mother and child and do a great impression of Usain Bolt in the 100 meters. Okay, hyperbole for sure, but how the heck does a body recover from that. Even the sun has more sense than to get up that early. I was dog tired but sleep wasn't ready to do me any favors. I guess I should be grateful that I live indoors and it wasn't a copperhead getting cozy or a coyote nuzzling my cheek. That's probably a good thing so I'll put it in the win column. It wasn't too much of a problem because I get up pretty early anyway but the question remains ... Why do these things always happen in the middle of the night? I've found most really bad news comes in the middle of the night (Yes, I consider 4 am the middle of the night). Nobody wakes you up at 4 am to tell you they've won the lottery and they're giving you half cause you are a fabulous human. I have, however, had several lawyers and bankers from other countries tell me I've inherited millions of dollars or they want me to distribute their millions because they are so concerned with getting the money out of their country. I am apparently their last resort. And all this because I'm divine and saintly. But even they don't call! They just send me endless emails promising me "riches beyond the dreams of avarice". Isn't avarice one of those seven deadly sins? That's why, when I go to bed, my phone goes into airplane mode. As if to pile insult right smack on top of injury, at 7 am (still not a civilized time for noise) the gardening crew showed up next door with their gas-powered hedge trimmers, gas-powered leaf blowers, gas-powered chainsaws, and the accompanying gas-powered megaphones attached to brainless human gas-bags yelling orders at each other. I try to be tolerant. I really do. So I don't say anything. You have to pick your battles well in this life. I understand it gets hot here in the middle of the day. I understand they want to get going early so they can get home early to their beers, burgers and bourbon whiskey. I know all that. So I go with the flow. I'm just glad this doesn't happen every day. Most days I can ease my way into the day with thoughtful, quiet expectation and exuberance. I think I'll work toward that.